Tofu, really??? I can’t believe that I’m eating tofu, either. In its defense, it really has no taste except the seasonings that you add. And, I like that it’s not greasy or tough like some meat can be. It cooks up really fast and with our record-breaking heat in Atlanta lately, the quick, stove-top dinners are the best. Add ravioletti to boiling water. Cook according to package directions. (about 5 minutes). Heat olive oil in a nonstick skillet. Crumble the tofu in the skillet and cook until slightly browned. If you really don’t like tofu, you can use chicken. 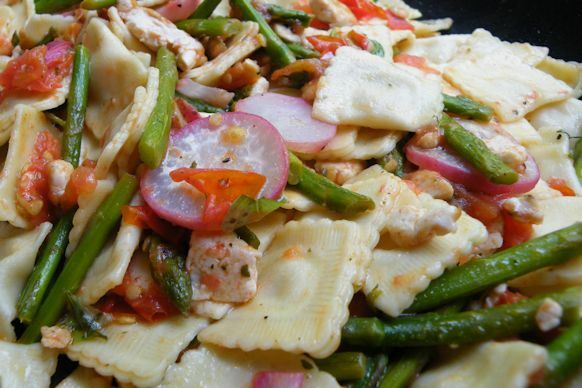 Add the asparagus, radishes, and dried basil; cook until asparagus is desired tenderness. Add the tomatoes, garlic butter and fresh basil leaves. Cook a few more minutes. Stir in the ravioletti and adjust the seasonings. Serve with a sprinkling of Parmesan cheese.